Agriculture is one of the most dangerous occupations in the United States and preventing illness, injury and death requires commitment and cooperation. 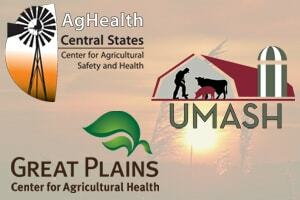 The US Centers for Agricultural Safety and Health were established to conduct research, education, and prevention projects to address the nation’s pressing agricultural health and safety problems. That is the mission of the three US Ag Centers which serve the Midwest Region – The Central States Center for Agricultural Safety and Health (CS-CASH), located in Nebraska; The Great Plains Center for Agricultural Health (GPCAH) located in Iowa and the Upper Midwest Agricultural Safety and Health Center (UMASH) located in Minnesota. Our centers have come together to reach farmers with specific safety and health information to improve the lives of farmers, farm families and farm workers. While each center has a unique focus – we all share information and resources across state lines for the betterment of agriculture in our region. Whether the topic is roadway safety, respiratory protection or safe animal handling, our Centers connect farmers with research based information. Coming together, staying together and working together has been a winning solution for us – but more importantly to the farmers we serve. To learn more about our centers and the health and safety resources we provide, visit our websites and connect with us on social media. 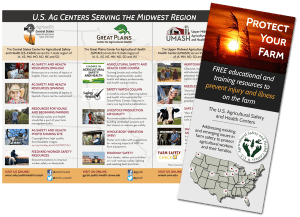 The U.S. Ag Centers serving the Midwest Region collaborated on a brochure with resources and information about each Center. Feel free to download and use/share the brochure with others who may be interested.